We’d love your help. Let us know what’s wrong with this preview of Jesus by John Piper. Must you hear the gospel to be saved? Piper answers a resounding yes. He actually breaks it down into three questions that he answers yes to. Is there an eternal hell of conscious torment to be rescued from? Is the death and resurrection of Christ essential for that rescue? Do people need to hear this good new and believe it in order to be rescued? Since the Bible answer to all these questions is yes, then the truly loving thing to do is to tell people the truth. You may be labeled arrogant, nar Must you hear the gospel to be saved? Piper answers a resounding yes. He actually breaks it down into three questions that he answers yes to. Is there an eternal hell of conscious torment to be rescued from? Is the death and resurrection of Christ essential for that rescue? Do people need to hear this good new and believe it in order to be rescued? Since the Bible answer to all these questions is yes, then the truly loving thing to do is to tell people the truth. You may be labeled arrogant, narrow minded, presumptuous, offensive and politically incorrect, but it won't matter in eternity. I think this book was just alright, but maybe better than I expected in some ways. This is my first book to read by Piper, though I've obviously heard a lot about him and have read excerpts of things he's written before. I really like the topic of the book, and I think it's intriguing and an important question that most Christians will/should consider at some point in their Christianity. Actually, the interesting thing is that even while I was reading it, a brand-new believer asked me the same q I think this book was just alright, but maybe better than I expected in some ways. This is my first book to read by Piper, though I've obviously heard a lot about him and have read excerpts of things he's written before. I really like the topic of the book, and I think it's intriguing and an important question that most Christians will/should consider at some point in their Christianity. Actually, the interesting thing is that even while I was reading it, a brand-new believer asked me the same question. I can't say my answer was the exact same as Piper's though. I think that Piper generally does a great job of answering the question and dissecting it into its various nuances. He seems to have a pretty good command of the issue at hand when this question is asked. Personally, I don't think a view on Hell (either annihilationist or otherwise) needs to be in any way defined to answer this question. But I can see how someone of Piper's theological persuasion might see that as inherent in this question. One of the first things I didn't like about the book though was that his introduction was entirely too dogmatic. He confronted all the major arguments and stated all his main conclusions right at the beginning, and he did it as if his ideas were both obvious and indisputable. I don't appreciate that line of argument or reasoning. I was happy to see that throughout the book, he actually did converse with many of the main contrasting ideas, and as far as that's concerned, his footnotes were also much more fair to dissenting ideas/opinions than the actual main content of the book. I appreciate at least that. Also, as he's considering many of the arguments, he seems to alternate between some proof-texts and some actual consideration of the internal context. Obviously I don't appreciate the proof-texts, but I certainly was happy he went in-depth on some aspects of the context and I applaud him for that. However, my main overall problem with his approach, that doesn't seem to let up anywhere in the book, is that he seems to believe all theological issues, and certainly this particular one, have defined and clear answers in the Bible. He doesn't seem to take the human element into consideration, along with the idea that just maybe WE (which includes the Bible's authors themselves) don't actually know the full answer to this question. He seems to think this is a sort of "mathematical" question, where if you find 1 and 1, then you know you've got 2. When I read the beginning of Romans, I can see that Paul is making a reasonable/logical appeal from what he can see and from (I assume) some inspiration of the Holy Spirit. But when he gets to Romans 2:15, the translation variously reads "sometimes defending" or "perhaps excusing" them on the Day of Judgement. It sounds like Paul is taking a guess here and the guess seems to be that maybe God will take mercy (on the Day of Judgement) even on those who haven't known the specific history of Jesus but who have followed and submitted to what God HAS shown them. It doesn't sound like it's set in stone, but there's no reason to assume it should be. We won't be the judges, so why should we expect to have a full criteria of judgment revealed to us? Especially when we consider that one of the overarching and most consistent descriptions of our judge is that he's "merciful". Paul wrote letters to churches, about how to conduct their lives and how to believe in Jesus. He didn't write theological textbooks. Why should his letters be following classical (i.e. mathematical) parameters of logic? So, it definitely comes off as dogmatic and unnecessary for Piper to require a black and white answer to this question, and to ignore the perfectly human aspects of the Bible that seem to offer opposing thoughts. My last contention is Piper's claim to speak "on behalf" of missionaries, claiming the missionary cause is defeated by believing God has mercy on some who've never heard his historical name. As a missionary myself (a long-term one, not just a show-up-every-now-and-then) one, I'll say that's certainly not the case! It's true, as Piper claimed, that believing God might have or have had mercy on people who've never had the opportunity to hear his explicit history takes away some of the urgency in the work. But I think that's both appropriate (certainly more balanced) and gives God even more glory (Piper's own stated objective)! It helps keep me from rushing around like a clown thinking it's my urgent work to make sure no one goes to Hell. Instead it puts the focus back on God and seeks to observe and participate in the work he's already doing. It's his saving work, and though he chooses to use me in it, it doesn't rely on me. It also certainly does broaden my perspective of the Gospel, and removes it from the limitations of individual eternal destinies but allows me to consider what God's plan is for this whole world! That makes the message I share both more life-giving and more in line with what we read in the Bible. And it's worth sharing (and motivating me to share) regardless of my consideration that God may have already been working on (and perhaps giving mercy to) some I'm sharing it to, or some in the community who've already passed on but who've helped lay a solid foundation for those following them to receive the message I'm bringing. I certainly believe the historical consideration of God's work in Jesus is more fulfilling and life-giving than any general revelation, even if God might/does take mercy on those who've had nothing more than the general revelation (or some specific revelation too that was less explicit than the historical one we have now), and that motivates me to share! It also keeps the focus on WHO is the judge: Jesus. Not our preconceptions of the things that limit his judgment. And I'm saying all this as an active missionary. It doesn't undermine my foundation in any sense, but undergirds it even more strongly with a broader view of who God is and what he does in this world. Finally, I appreciate that through this book I've come to see that my own views on the matter are well-represented within Orthodox Christianity. And there's a name for it: "inclusivism"! While the nuances of my belief on it may not be entirely the same as those with that label, it's nice to know there are plenty other Jesus-seeking Christians who've come to consider that this sort of work might be or is part of his plan. 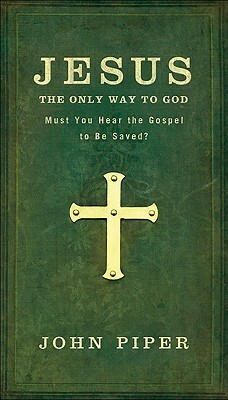 Excellent book explaining biblically why you MUST hear the gospel to be eternally saved. The only problem that I had with the book was the format. I am not so much an audio learner and usually reserve audio books for my fiction/pleasure reading. Theological audiobooks always leave me wanting to purchase a hard copy! One that I can read, reread and mark up. I did listen to this book two times but would still like a hard copy. That said, the content was excellent! 1. Will anyone experience eternal, conscious torment under God's wrath? 2. Is the work of Jesus necessary for salvation? 3. Is conscious faith in Jesus necessary for salvation? The first section, as you might expect, is a defense of the doctrine of hell--a doctrine that's made people uneasy for centuries, but which was recently brought to the forefront of the public consciousness by Rob Bell's recent (and controversial) book, Love Wins. This was, in my opinion, the strongest section in the book. Piper does an excellent job of identifying the abundance of scriptural support for the orthodox view of hell. In Piper's view, a clear understanding of this doctrine is a necessary and foundational catalyst for missions. The second section addresses the pluralistic claim that there are many ways to God. Piper emphatically insists that the atoning work of Christ is "the one and only way for anyone to get right with God." There is, as you can imagine, a substantial amount of scriptural support for this position as well. Again, Piper uses his conclusion as a springboard for passionate commitment to missions and the spread of the gospel. The third and final question is addressed in four chapters, each of which engages with a different nuance of or objection to the idea that conscious faith in Jesus is necessary for salvation: 1) those who don't know about Jesus or who lived before the Incarnation; 2) Cornelius's conversion in Acts 10; 3) the Biblical teaching that there is no other name under heaven whereby we must be saved; and 4) Paul's attitude toward and teaching about the missionary task. These discussions are not quite as well-supported as the previous sections--which makes sense, since solid theologians have been wrestling with these issues for a really long time, and there is not, as yet, one widely-accepted answer to these admittedly very difficult questions. Piper concludes that conscious faith in Christ is indeed necessary for salvation--a belief that drives his passion for missions. I don't have a problem with any of Piper's arguments (though I think sometimes he's a little too quick to derogate the opposition as being fundamentally incompatible with any serious commitment to missions--I think we've seen throughout history that 'fuzzy' Christians (for lack of a better word) can be very passionate about missions and have even risked their lives to share the gospel). The thing is, I'm not really sure how many of Piper's 'opponents' on this issue base their beliefs on a careful and rational study of the Bible. There's a huge emotional cost to holding these beliefs, and plenty of folks just can't handle the idea of Uncle Joe stuck in eternal torment with no hope of escape. Modern journalism has allowed us a glimpse of just how many people die every day--every hour--in faraway lands. It's hard enough to stomach temporal tragedy; never-ending suffering is just too much to accept. For these individuals, I don't think Piper's arguments, however biblically supported, will be sufficient to overcome their deeply ingrained hostility to and horror of the reality Piper describes. But perhaps this book will at least show them the true basis of their opposition to the doctrines of hell and the exclusivity of Christ. 1) The entire human race has sinned and offended God. 2) The punishment for such sin is eternal. 3) Man cannot atone for this sin by his own means. 4) By grace through faith in Christ, man can be saved from eternal punishment. 5) Apart from the grace of Christ, there is no satisfaction for man's sin. 6) Man can come to the grace of Christ by hearing the Gospel. 7) Without being preached to, a man cannot come to the grace of Christ. Piper presents a mostly convincing argument for the first six points, but fails to ever prove point #7, and indeed assumes its validity. At one point, he provides five verses from John to show that salvation only comes from Christ by the preaching of his apostles. Five for five verses point to Christ as the only means of salvation. Five for five verses fail to make any mention of the apostles' preaching, much less the necessity of it. John Piper's argument fails because he mistakes the ordinary means of learning about salvation for the exclusive means of learning about salvation, and he ignores the possibility of private revelation - an oversight made all the more amazing by the fact that he often quotes Romans. The author of Romans, St. Paul, did not come to Christ through the preaching of the apostles. Named Saul at the time, the young Pharisee impassively watched the execution of St. Stephen, and promptly set out to kill Christians outside the Jerusalem area when Jesus Christ Himself relates to him the Gospel. It was not the preaching of men that converted Paul, but the direct revelation of God. This is an example of a larger fallacy in Piper's work: If Scripture talks about or emphasizes that X is a property of A, then Y cannot sometimes be a property of A. The argument is set in the curious context of "motivation for missions" - as if the motivational consequences of a theological doctrine could have any bearing on the truth of that doctrine, one way or another. Further, I don't find Piper's claim that the theoretical possibility of salvation by faith through grace apart from preaching - the barest hint of which is emphatically denied by this work - would have a significant and detrimental effect on the motivation of missionaries. The difference is akin to the difference in motivation between two rescue workers: the first told that if he does not reach a stranded man, that man will surely die; the second told that if he does not reach the stranded man, there is the faintest of theoretical possibilities that the man may survive. Through the years there have been those who have decided that perhaps people can come to God without Jesus. Some have declared that those who reject Jesus are annihilated. Others claim that the condemned eventually are brought to repentance after a period of punishment. Then others tell us that those who have never heard of Jesus can actually come to God by following the knowledge that they have from nature. A Hindu who is a good Hindu can come to God without consciously believing Jesus. The ques Through the years there have been those who have decided that perhaps people can come to God without Jesus. Some have declared that those who reject Jesus are annihilated. Others claim that the condemned eventually are brought to repentance after a period of punishment. Then others tell us that those who have never heard of Jesus can actually come to God by following the knowledge that they have from nature. A Hindu who is a good Hindu can come to God without consciously believing Jesus. To each of these questions Piper gives a resounding “YES!” as an answer. Though the book is short and the chapters concise, the Biblical exegesis is sound. The answers are true to the historic faith of Christianity, and they are certainly Biblical. Piper explains the statement that God passed over the times of man's ignorance and shows that it does not mean that God forgave those who did not trust in Jesus. He also shows that Cornelius, though a God-fearer, had to hear and believe the Gospel to be saved. He did not receive salvation simply by being a good person who did his best. Piper also shows that we must indeed consciously trust Jesus if we are to be saved. He does so by reminding us that there is no other name under Heaven by which we must be saved. Finally, Piper demonstrates that the apostle's missionary purpose was not to help people learn that they had already been forgiven, but that their purpose was to preach Jesus so that people would believe and receive forgiveness. In a pluralistic world it is easy for us to bend and yield to the pressures against the exclusive claims of Christ. In reality, we must say that Christianity is exclusive of those who WILL NOT believe, but is inclusive of ALL WHO WILL believe. The door of opportunity is open and sinners MUST BELIEVE the Gospel. I'm glad that Piper has chosen to take his stand as one who holds fast to this truth. This book freely provided for review by Baker Publishing and there was no expectation of a positive review. For starters, this is a good book. Piper does a great job of stating his case, which is three fold: 1. Hell is a place of eternal, concious torment. 2. Humanity is saved by the work of Jesus Christ on the cross and through his resurrection. 3. A person must hear the gospel in order to be saved. Piper presents his views clearly and succintly, and even includes some correspondence with John Stott, with whom he disagrees about issue number one. I do, however, disagree with some of his conclusions, in For starters, this is a good book. Piper does a great job of stating his case, which is three fold: 1. Hell is a place of eternal, concious torment. 2. Humanity is saved by the work of Jesus Christ on the cross and through his resurrection. 3. A person must hear the gospel in order to be saved. 1. While I tend to lean toward Piper's view of hell, I can't discount annihilationism as quickly as he does. I believe that the Bible seems to establish eternal torment as hell, but there are some verses that cast some doubt on the subject. But overall, a pretty good treatment by Piper. 2. I completely agree that Jesus' death and resurrection are the salvation of humanity, establishing his lordship on the Earth. In this, I think Piper and I are in full agreement. 3. This is where Piper and I diverge. I'm not sure that the gospel must be presented to a person for that individual to be saved. If that is so, God created billions of people for no purpose other than hell, as the majority of the earth in history had no chance to hear the gospel. This isn't necessarily a problem for Piper, who believes in predestination, but for me, it seems out of character for God, as he is presented in the Bible. Where Piper's argument really falls apart, in my opinion, is when he suggests that infants and mentally incapacitated people do not go to hell, as they cannot understand the gospel. Piper, in this regard, would like to have his cake and eat it, too. If one believes that unevangelized peoples go to hell, then so do babies and the mentally incapacitated. There is no difference between not hearing the gospel and not being able to understand it. Either way, the gospel message was not communicated. Is it necessary for a person to have actual, conscious faith in Jesus Christ in order for them to be reconciled to God? Do those who either refuse Jesus or who simply never hear of Jesus spend an actual eternity in hell under the wrath of Almighty God? In Jesus, the Only Way to God, John Piper addresses these questions in his inspiring, helpful, and typically thorough style. Simply put, Piper nails this issue with the word of God. He is not arrogant, belittling of others, or sensational Is it necessary for a person to have actual, conscious faith in Jesus Christ in order for them to be reconciled to God? Do those who either refuse Jesus or who simply never hear of Jesus spend an actual eternity in hell under the wrath of Almighty God? In Jesus, the Only Way to God, John Piper addresses these questions in his inspiring, helpful, and typically thorough style. Simply put, Piper nails this issue with the word of God. He is not arrogant, belittling of others, or sensationalistic in this work. Piper simply goes to the Scripture to explain what Christians have believed from the word of God for centuries. In chapter 5, Piper addresses the question of whether or not Cornelius was already saved before Peter came to tell him the gospel. Piper eventually argues that Cornelius represents a special kind of person in the world, one who seeks after God in an extraordinary way. Piper then illustrates this idea by quoting a story of missionaries in Ethiopia. It is strange, then, that Piper does not explain this conclusion about lost God-seekers in the light of Romans 3:11 which declares that no one seeks after God. People in our churches are actually asking whether or not one must have conscious faith in Jesus in order to be reconciled to God; thus, we need a work like this one from Piper to answer them. While the brevity of the work leaves a question or two unanswered, Piper does an outstanding job of answering what needs to be answered with biblical soundness, thoroughness, and readability. If you have any struggles with the question of the exclusivity of Christ and the necessity of conscious faith for salvation (or if you know someone who has these struggles), this book is an excellent resource for you. I received an excellent copy of the audio recording of this work from ChristianAudio.com. The narration was very well-done and quite easy-to-listen-to. This is a short helpful read. The kind of book that I will have handy to give to a Christian who is struggling with the implications of the necessity for all people to have conscious faith in Christ for salvation. While dealing with this issue he raises the issue of annihilationism (I was pleasantly surprised that he took on John Stott explicitly regarding this)and universalism. It is written in a very accessible way though like the other Piper books I have read he does not just give the answers This is a short helpful read. The kind of book that I will have handy to give to a Christian who is struggling with the implications of the necessity for all people to have conscious faith in Christ for salvation. It is written in a very accessible way though like the other Piper books I have read he does not just give the answers to the questions that he raises, he demonstrates them. This is a strength of the book, but some may lose interest because of it. I also found it helpful that he quoted from the opposing viewpoints. A theme throughout the whole book is the devastating effect that being wrong on this issue has on missionary motivations. At the end of the book he dismantles the weak attempts by those who claim that missionary motives are actually strengthened by believing that some get saved apart from conscious faith in Christ. There was only one place that I remember in which covenant theology leanings came through, though it was not highlighted in any major way. Piper wrote this book to demonstrate to the reader the necessity of missions to yet-unreached lands. If people believe that the “innocent” natives who have never heard the Gospel will not be condemned, they will not have a compelling motive for evangelizing them. Piper writes to convince us that conscious faith in the name of Jesus is required for salvation. Overall this was a good book. Piper makes a convincing case that unreached people are condemned and without excuse. They need to hear about Piper wrote this book to demonstrate to the reader the necessity of missions to yet-unreached lands. If people believe that the “innocent” natives who have never heard the Gospel will not be condemned, they will not have a compelling motive for evangelizing them. Piper writes to convince us that conscious faith in the name of Jesus is required for salvation. Overall this was a good book. Piper makes a convincing case that unreached people are condemned and without excuse. They need to hear about Jesus. Simply seeking the truth is not sufficient, because the name of Jesus must be claimed. This is a powerful impetus to evangelize and seek out the seekers in any tribe or nation. I think Piper makes an error in his assessment of Cornelius, though. He judges Cornelius to be lost before Peter preaches Christ to him, seeing his situation as identical to an unreached heathen. But Cornelius was a god-fearer with much knowledge of God. He lived during the unique transition from Old to New Covenant, when I believe fearers of the God of Israel were saved if they hadn’t yet heard of the Messiah, Jesus. I don’t think this disagreement changes my basic appreciation for his argument above, though. Piper argues that the Bible says that Jesus is the Way, the Truth, and the Life. Jesus is the only name by which we are saved. Piper explains that universalism (all roads lead to God) and annihilationism (unbelievers are simply destroyed and do not suffer eternal punishment in hell) are not Biblical. As much as we would like to believe that someone who hasn't heard of Jesus will be saved that belief is contrary to Scripture, which should create a sense of urgency for missions and for each of us Piper argues that the Bible says that Jesus is the Way, the Truth, and the Life. Jesus is the only name by which we are saved. Piper explains that universalism (all roads lead to God) and annihilationism (unbelievers are simply destroyed and do not suffer eternal punishment in hell) are not Biblical. As much as we would like to believe that someone who hasn't heard of Jesus will be saved that belief is contrary to Scripture, which should create a sense of urgency for missions and for each of us to share the Gospel with everyone we know. Piper does a thorough job of arguing from scripture that a conscious faith in Jesus is necessary for salvation. He does this by demonstrating that there is real eternal conscious torment for unbelievers, that the work of Jesus is the only basis to be saved from that torment, and how natural revelation is insufficient to save those who have never heard of Jesus. This book is for Christians who struggle with questions regarding the existence of hell, the exclusivity of Jesus' claim as t Good book. This book is for Christians who struggle with questions regarding the existence of hell, the exclusivity of Jesus' claim as the only way to God, and the fate of unreached people groups who have never heard the gospel. I believe reading this book will help you understand (from scripture) why evangelism is vital and missions is absolutely necessary and urgent, especially frontier missions to unreached people groups. This book is for non-Christians who may be offended or put off by the claim Christians make that Christianity is the only path to God and pluralism is false. This book will help you understand why Christians have come to this conclusion, that it is based on an honest study of Christian Scriptures, and not based on prideful bigotry. Did not enjoy this book at all. Did not find any of his arguments compelling or conclusive. However, two biggest issues revolve around everlasting punishment of the wicked and God winking. A. First, I really have no idea how this is germane to the issue at hand. B. Second, this definitely should not be the initial reason one proposes as why you need the Gospel to be saved. C. His arguments against the annihilist viewpoint is at best weak. Multiple of the points he Did not enjoy this book at all. C. His arguments against the annihilist viewpoint is at best weak. Multiple of the points he admits are open to interpretation. D. Given how weak the argument is and how I can't see its germane, it really starts the book off on a poor footing. As with most of Piper's books, this little work was theologically solid, expositionally clear, and a bit underwhelming in terms of its style (I maintain that Piper is the greatest living preacher, but that doesn't always transfer over into being a phenomenal writer). This book is an excellent introduction to the question of whether pagans and other non-believers who seem to be sincerely seeking some sort of religious experience can be considered "believers." Piper gives the traditional and ortho As with most of Piper's books, this little work was theologically solid, expositionally clear, and a bit underwhelming in terms of its style (I maintain that Piper is the greatest living preacher, but that doesn't always transfer over into being a phenomenal writer). This book is an excellent introduction to the question of whether pagans and other non-believers who seem to be sincerely seeking some sort of religious experience can be considered "believers." Piper gives the traditional and orthodox (and of course Biblical) answer that in fact conscious faith in Christ is necessary to salvation. Along the way to this conclusion, Piper likewise engages the question of the reality of hell (do nonbelievers need to be saved in the first place) and the nature of our salvation (through the life and death of Jesus). Piper's quick answer is "Yes." So is mine. People are lost without hearing the message of Jesus. The New Testament world is one where explicit faith in Jesus is the way of salvation. There are caveats, for sure. They need to be made. But what is amazing is the emerging of a whole industry of salvation based on the supposed well-intentioned pagan of Romans 1 who lives up to the light that is within him. My impression in the reading of the Bible that this cannot be a certain path of salvation. In f Piper's quick answer is "Yes." So is mine. People are lost without hearing the message of Jesus. The New Testament world is one where explicit faith in Jesus is the way of salvation. There are caveats, for sure. They need to be made. But what is amazing is the emerging of a whole industry of salvation based on the supposed well-intentioned pagan of Romans 1 who lives up to the light that is within him. My impression in the reading of the Bible that this cannot be a certain path of salvation. In fact, its very rarity is the reason to take the Gospel to the ends of the earth NOW. Piper basically deals with three questions: Is hell real? Is Jesus the only way of salvation? (and) Can people be ignorant of their own salvation? I naturally agree solidly with Piper on the first and lean on the third, but unfortunately, the book's rhetoric is lacking. Piper goes through the tried and true arguments and offers few new thoughts. I doubt any Christian would be persuaded by it. It's true old stuff, but the truth is never old. Piper starts by suggesting that Christians are losing the nerve to tell the world what the Bible actually says. It tells us that there is an eternal hell, the death and resurrection of Christ is essential for rescue from hell, and people need to hear and believe the news of Christ in order to be rescued. This should motivate missions and the importance of speaking the gospel to those around us both in our immediate vicinity and around the globe. Is Jesus necessary for salvation, or can people attain heaven through other religions or even merely by God’s general revelation through creation? These are the questions Piper carefully addresses in this short book which, though brief, is powerful in its treatment of these issues—critical points of contention in this postmodern, pluralistic age. Piper is unflinching in his affirmation of the Biblical truth of Jesus—there is no other name by which we may be saved. I finished this one in a couple of days. It was either really good, or just realy applicable to my circumstances at the time (or both). I often hear these types of questions being asked (ex. what about the people that live in the jungle who have never heard...will they be saved? What about my grandmother who is Jewish? ) I, of course, never have the right answers, but this book gave me some guidance on my role to those who've never heard. Excellent book. 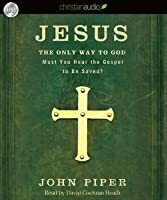 John Piper builds a case for why one must hear of the work of Jesus Christ in order to be saved; one cannot have the benefits of Jesus' atoning work and be saved without actually hearing of the name of Jesus Christ. He looks at the most common objections and answers them thoroughly. His scholarship and exegesis of Biblical passages is impeccable. I've read this book twice. This is a great treatise on the necessity of the Gospel. The only reason I gave 4 stars is that he makes some strange passing comments about faith in the OT that confused me. He later seemingly clarifies what he meant but it still remains that he could have worded it better. I probably went through this book too quickly to get its full benefit. Even the level at which I read it showed Piper's reasoning to be sound and biblically based. Everyone needs to hear and be transformed by the Gospel of Jesus Christ in order to be saved. Anything else cannot be defended but by speculation, and such speculation leads to diminished motivation to lead our lives for Christ. Read this brief treatise in just a few hours. It is brief, but poignant in what Piper seeks to accomplish. Namely, the exclusivity of Christ for salvation, and the implication for missions. Read this book, if you believe the Bible, you will be helped. This little book provides a solid exegetical look at the reasons why Jesus is the only way. Although some may disagree on some points, the overall charge to the church is to proclaim and defend that Christ is "the way, the truth, and the life. No one comes to the Father except through" Jesus. Piper methodically dispels salvation outside Christ. He also provides all the evidence you need that post Christ salvation is in His Name alone. That salvation by revelation through nature is dispelled in the era of Christ. John Piper is founder and teacher of desiringGod.org and chancellor of Bethlehem College & Seminary. For 33 years, he served as senior pastor at Bethlehem Baptist Church, Minneapolis, Minnesota. He grew up in Greenville, South Carolina, and studied at Wheaton College, Fuller Theological Seminary (B.D. ), and the University of Munich (D.theol.). For six years, he taught Biblical Studies at Bethe John Piper is founder and teacher of desiringGod.org and chancellor of Bethlehem College & Seminary. For 33 years, he served as senior pastor at Bethlehem Baptist Church, Minneapolis, Minnesota. He grew up in Greenville, South Carolina, and studied at Wheaton College, Fuller Theological Seminary (B.D. ), and the University of Munich (D.theol.). For six years, he taught Biblical Studies at Bethel College in St. Paul, Minnesota, and in 1980 accepted the call to serve as pastor at Bethlehem. John is the author of more than 50 books and more than 30 years of his preaching and teaching is available free at desiringGod.org. John and his wife, Noel, have four sons, one daughter, and twelve grandchildren.